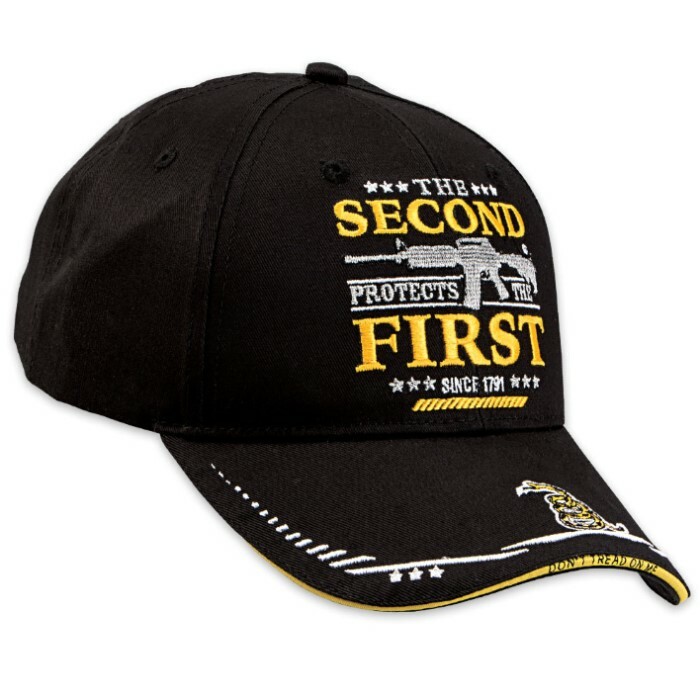 "The Second Protects The First" Cap / Hat | BUDK.com - Knives & Swords At The Lowest Prices! 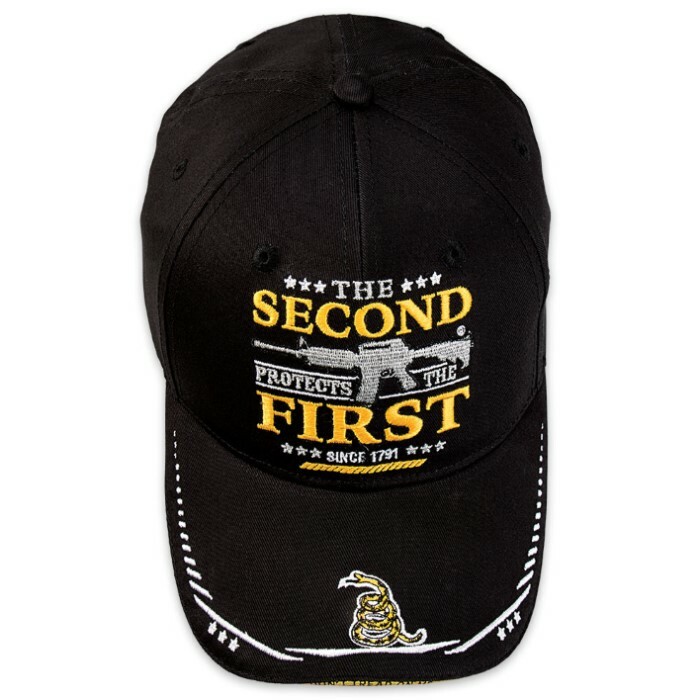 Voice your opinion on the first and second amendment with this The Second Protects the First Cap! This six-panel hat features a full color embroidery on the bill and the front of the hat. The words, "The Second protects the First" will let people know where you stand! It is made of 100% light cotton twill and has an adjustable velcro closure on the back. This is a tremendous value for the money. I have gotten a lot of comments on this hat. If you are a patriot then you need to have one of these. I have gotten great products from BUDK and will continue to shop at their site. Thank a lot. I got one in a shtf box. Well made and got a point to prove. Very happy with product,arrived in great shape. I’m getting lots of compliments from friends and strangers. Not my first order,won’t be my last. An average quality cap, but the quality was not really what I cared about. 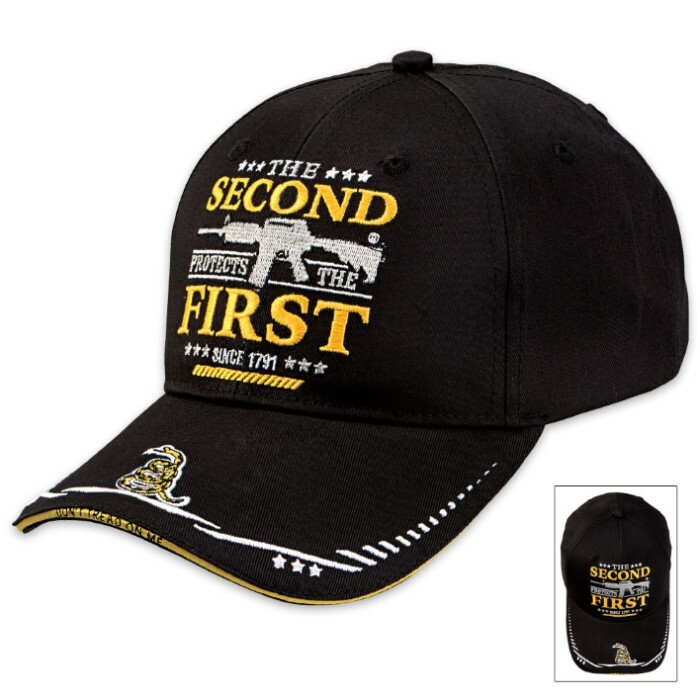 The message of this hat is so powerful, and needed today, you HAVE to buy it. I live in NY, and I just never get tired of making liberals cringe at this bold proclamation of our 2 most important amendments. If you are pro 2nd Christian/Baptist you have got to buy it. And at this price, can't turn it down. I am very impressed with the quality of these caps offered by BUDK. I own several different caps,including this one,offered by BUDK and I am very pleased with all of them. I recommend this cap to everyone.